Lions Share provides a service to students, parents, faculty, and community. 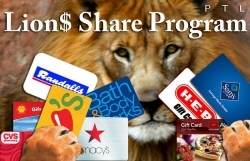 By purchasing gift cards through the Lions Share Program, our school Parent Teacher League (PTL) earns a rebate percentage of the price of the card. This rebate does not come out of your gift card value. Funds raised support LHN campus life activities such as the Homecoming BBQ, Balloon Arch, and Pie in the Face, Christmas Goodies Week, The Harbor Light Choir and other special guest performances, and The End of the Year Dodgeball Tournament. When you purchase a $25.00 Starbucks gift card, 7% comes back to the school. When you purchase a $25.00 Randall’s gift card, we get 4%. When you purchase a $25.00 Top Golf gift card, 8% go towards campus life. Honey Baked Ham… what a great gift for employees and co-workers… when you purchase a $25.00 gift card we will see 12% coming back to our campus. The Gap… what a great gift for you and the family… when you purchase a $25.00 gift card we will be tucking away 14%. Order forms available online and at the school office and the rebate % for each retailer is specified on the form. Order cards for expenditures that you would normally make, such as for groceries, gas, entertainment, and gift giving. Pick up and drop off order forms and payment (cash or check made payable to LEAH) at the school office. Cards are delivered the week following the deadline; delivery is dependent of FedEx, weather conditions, etc.